Hello! We've finally arrived at the end of the geometric challenge! This was my first time participating in a challenge and while it was stressful at times, I still loved every bit of it :) I feel so honoured to have completed this month with this lovely group of talented bloggers, and I hope you enjoyed it just as much as I did! 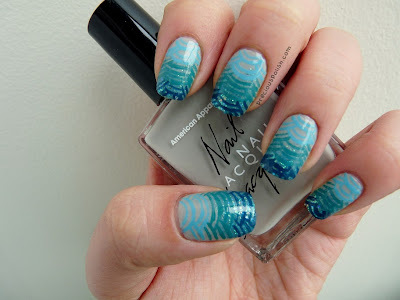 The last part of the challenge required us to recreate a manicure done by another blogger. 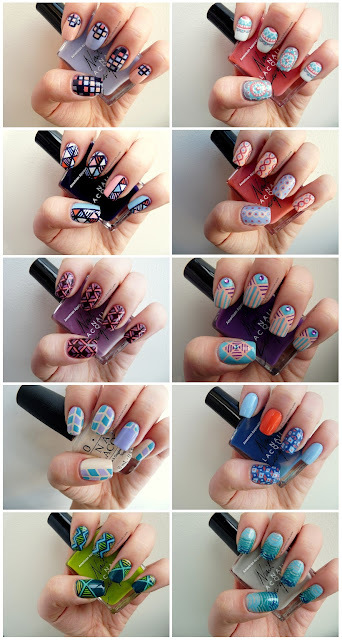 If you've been visiting the other blogs you know that there were so many spectacular nail designs to choose from! It was really difficult to choose just one so I ended up kind of combining two that I thought would look nice together. I originally tried to combine three but that didn't work out too well :P I took Alexis' design from day two (curved) and used Whitney's double gradient concept from day seven (polygon) to execute it. I really liked painting this one but if I did it again I would make the glitter gradient base more prominent and I would use a lighter base. I started with American Apparel Echo Park. I then sponged on a gradient with Sinful Colors Nail Junkie. With a striping brush I created the pattern using American Apparel The Valley, American Apparel Malibu Green, and American Apparel Peacock. Thanks so much for following the progress of this challenge with me! See you in March for more nail art! Wow! These are beautiful and detailed! I love them =) You did a great job in this Challenge, Brittney! You have such a distinct nail art style that is all your own and I really admire that! Great job, and I hope to do another challenge together someday! This looks fantastic. I've bookmarked some of your nails for future inspiration. Whoa these look awesome! You did amazing with this challenge!